The following checkbox ”Total discount is calculated automatically” makes sure that every order has its total discount calculated before it is posted. This is done in the “clicked method” that executes when the posting button is clicked, this means that total discount is calculated on the sales order even before you get the dropdown where you can choose the different types of posting i.e. Invoice or Confirmation. But as it turns out, this does not seem work if you multiselect in the sales order form(Click thumbnail below to see the form). I noticed a bug in the routine for printing out misc. charges on the SalesInvoice_SE document. 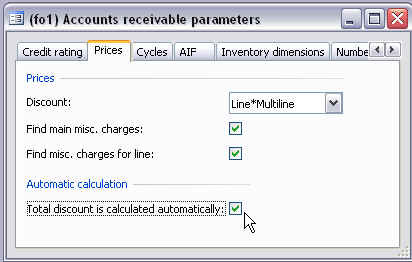 The problem is that the label that are printed is always “Amount currency”, and the routine doesn’t calculate the amount correctly when the category is set to Pcs or Percent. I Haven’t tested if the SalesInvoice document has the same problem, but the markupSpec method seams to have the same errors so I think it shares the same problems.